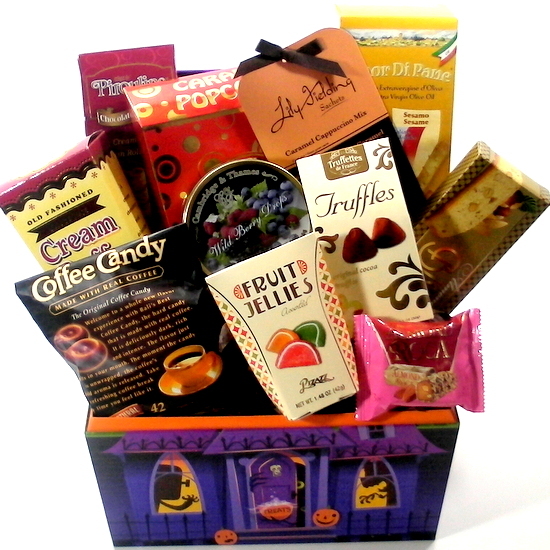 Happy Halloween Gift Basket is a Hallmark gift box that is filled with gourmet food sweet goodies, when you open the box you will be greeted with Happy Halloween. Toronto hand delivery Free. Halloween Gift Basket. Hallmark gift box filled with gourmet treats. Purple, Orange and Black Halloween images on gift box. Hallmark Happy Halloween music greeting gift box. 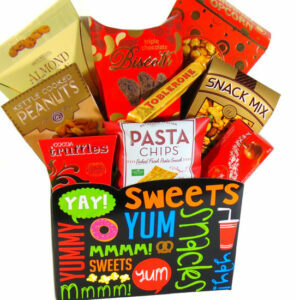 Order gourmet treats gift basket from the comfort of you home or office. Halloween gift basket delivered to the door steps of recipient. Gift basket filled with sweet goodies Chocolates, Candies and Snacks. Gift basket is a great gift and say Enjoy. FREE local hand delivery 7 days a week. All our Baby, Spa and Gourmet gift baskets. GTA, Toronto, Etobicoke, Concord, Scarborough, North York. Pickering, Ajax. Milton, Stouffville, Maple, Brampton, Mississauga, Richmond Hill, Thornhill, Markham, King City, Newmarket.